My dear friends, over the last few days i ve been asked several questions that i think need clarification. The first matter is the part in the Rulebook that speaks about visibility of boats. The answer is quite simple in fact: It is as the text says 1/3 of top and bottom of boats have to be in a contrasting color to the rest. So plain white (or whatever color) boats are not allowed!Next, it is advisable to use bright (fluorescent at best) colors for that 1/3 part to improve visibility. Nowhere it is written or said that the contrasting color has to be painted, adhesive strips are perfectly acceptable as long as they make a good contrast to the rest of the boat. Those who like the “carbon” look of their boats should well consider that if there is no really bright (at least 1/3rd) colored contrast to the rest of your boat, it will not be allowed to participate! 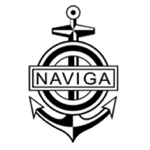 Next point is somewhat of a detail, As you will know there is a list of Naviga accepted Energy Limiters, but as manufactors keep on developing and improving devices, newer models of those manufactors come on the market. Needless to say these developments are off course allowed for use too. With these i mean the latest types from Wozniakrctech such as the mini version and the latest KLW 203.